Home Blog WP Rocket Review: A 47% Faster Website. Is It Worth Paying For? On my test website hosted on cheap Namecheap shared hosting ($10 per year – pretty low-quality! ), WP Rocket was able to cut the page load times from 1.5 seconds to 0.8 seconds. In case you don’t have a calculator handy, that means WP Rocket made my test site load 47% faster! Not only did it improve the raw page load times, it also shrank the file size by 17% and reduced the number of HTTP requests from 21 to 18. 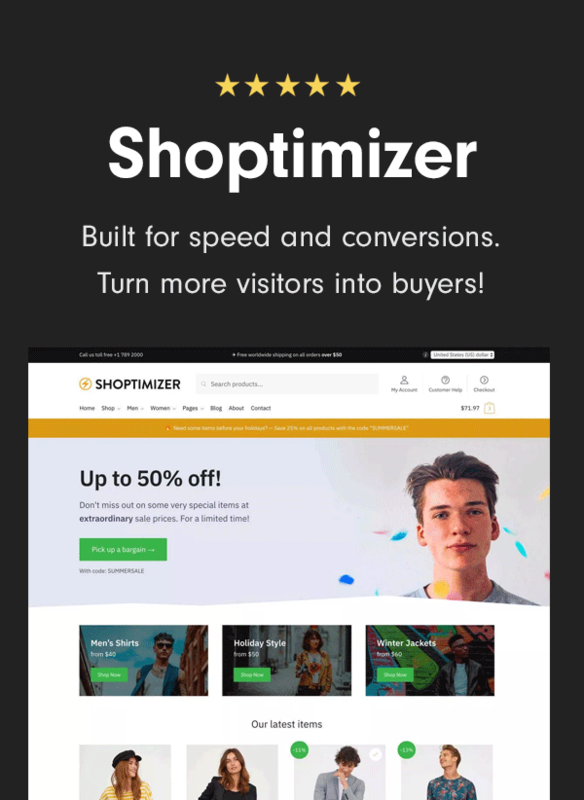 Interested in achieving something similar for your site? Keep on reading! 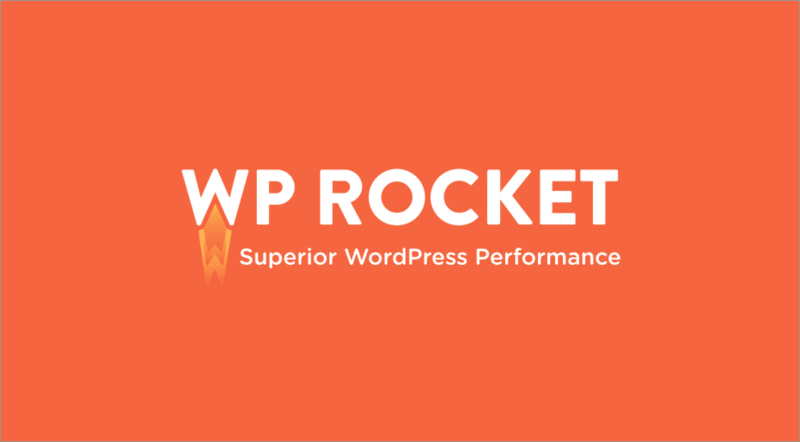 WP Rocket brands itself as a caching plugin, but it actually performs a lot of smaller optimizations that go beyond just caching. 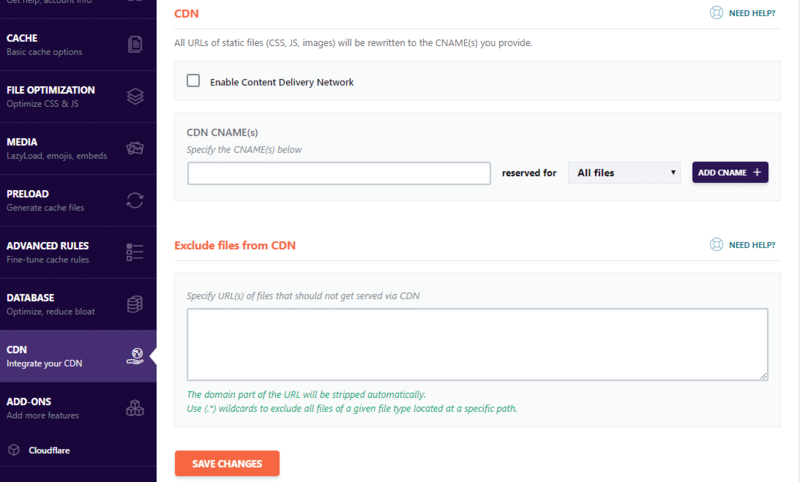 While some other caching plugins do this as well (e.g. W3 Total Cache), WP Rocket’s differentiator is that it doesn’t really require any configuration. If you’ve ever tried to configure the monstrosity that is W3 Total Cache, that’s actually a pretty important differentiator. That’s not to say you can’t get your hands dirty and configure things. It just means that you don’t have to. Basically, just clicking Activate is enough to significantly speed up most sites. So what does WP Rocket do? 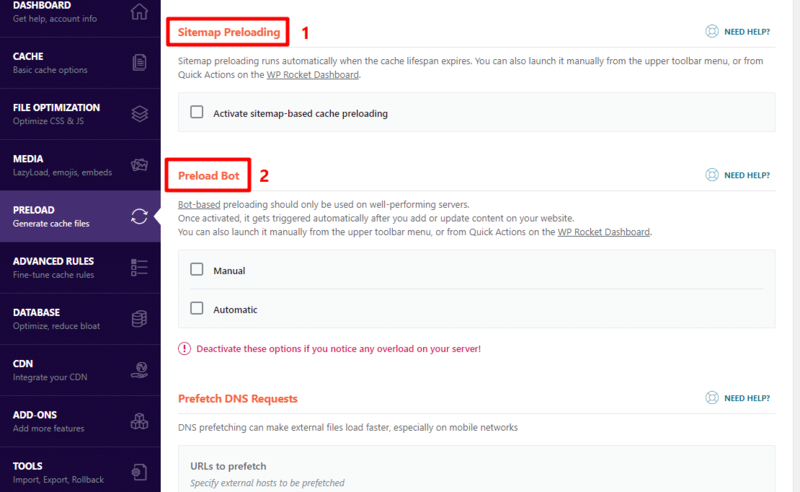 Cache preloading – this helps you “build” the cache so that your site is consistently fast. 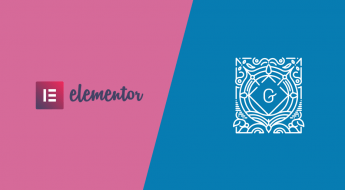 Minification/concatenation – this helps shrink and combine your CSS/JS files. 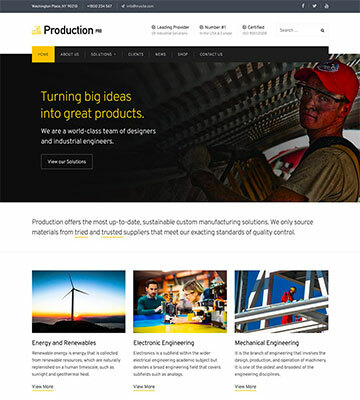 This interface is brand new and redesigned for WP Rocket 3.0, so if you read an older WP Rocket review before this one, you might notice that things look a little different. 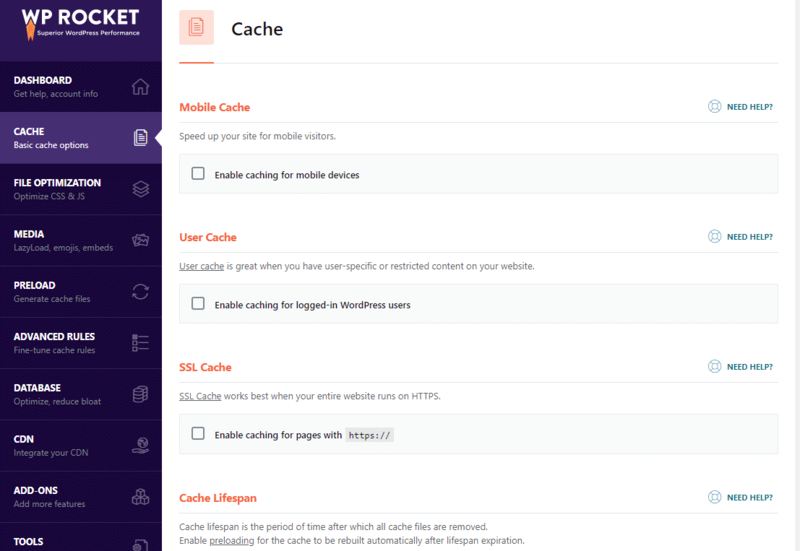 The main dashboard page lets you quickly clear your cache or preload your cache (more on this in a second). But otherwise, there’s not much going on. To configure WP Rocket’s more advanced settings, you’ll use the sidebar. Minification – shrinks the size of your site’s code by removing unnecessary characters (like whitespace) without changing any functionality. Remove query strings from static resources (this one won’t have a big effect, but it can improve your GTmetrix score, if you care about that). I recommend enabling as many of these settings as possible. 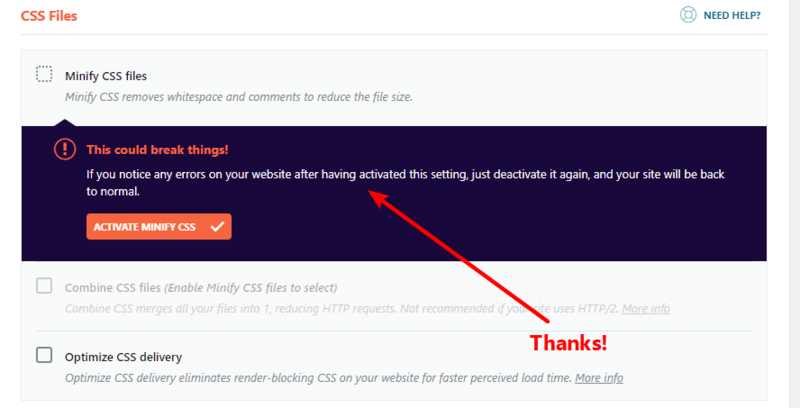 I say as possible because some of the settings for CSS or JS might cause issues with your site (this isn’t WP Rocket’s fault – it’s always a potential issue with minification/concatenation). Without preloading, your site only “builds” the cache for a page when someone actually visits the page. That means the first visitor after the cache lifespan expires doesn’t see the cached version (because the cache hasn’t been built yet). 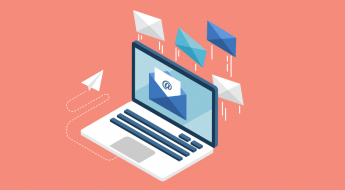 Cache preloading lets you ensure all visitors see the quick-loading cached page by “warming” the cache yourself, rather than waiting for someone to visit the page. If you’re a casual user, you probably won’t ever need to look at this section. 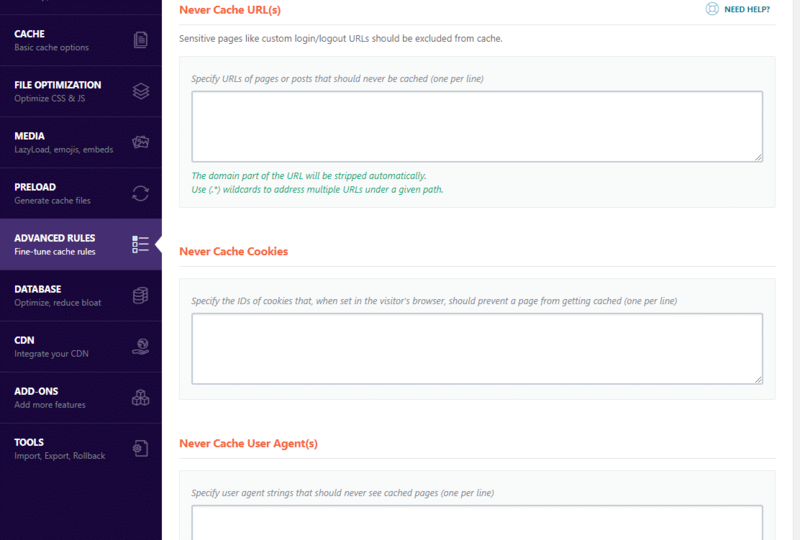 But for more advanced users, the Advanced Rules area gives you more control over how your cache functions for specific URLs, cookies, user-agents, etc. Basically – it’s not something most users will need, but helpful for advanced users that like to get their hands dirty. As your site ages, your database will pick up all kinds of “gunk” in the form of revisions, trashed comments, transients, etc. 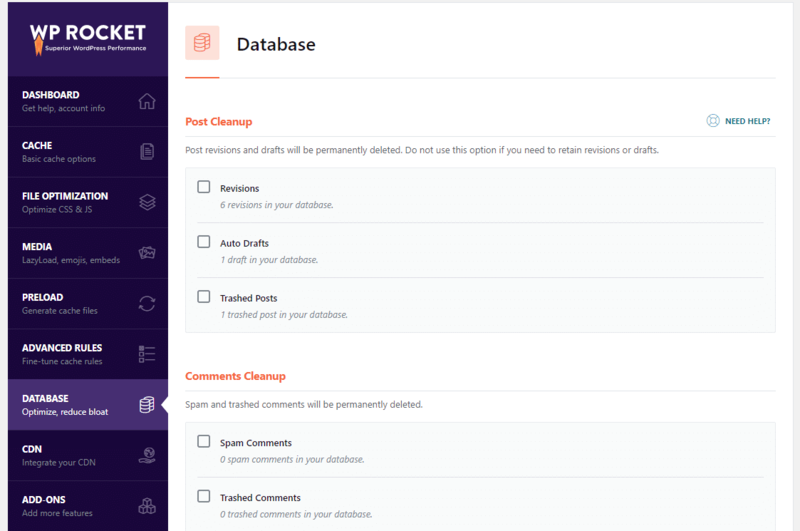 Personally, I find this to be the least exciting area of WP Rocket because there are plenty of free plugins that do a great job cleaning your database. But I guess the main advantage here is that WP Rocket eliminates the need for you to install a separate plugin. Do You Need WP Rocket To Get A Fast Site? Is It Worth Paying? I think WP Rocket is a great plugin. 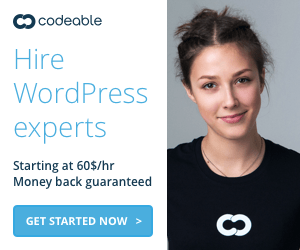 But no – you don’t need it to get a fast WordPress site. 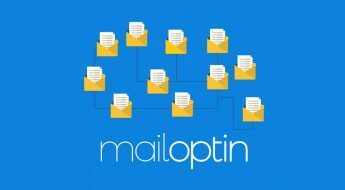 While you might miss out on some of the more advanced features/rules, you could approximate WP Rocket’s core functionality by combining free plugins like Cache Enabler (page caching), Autoptimize (minification/concatenation), WP-Optimize (database), WP-Disable (minor performance tweaks), BJ Lazy Load (lazy loading), etc. It will take you a lot more time to get everything configured. And, as you’ve probably heard, time is money. 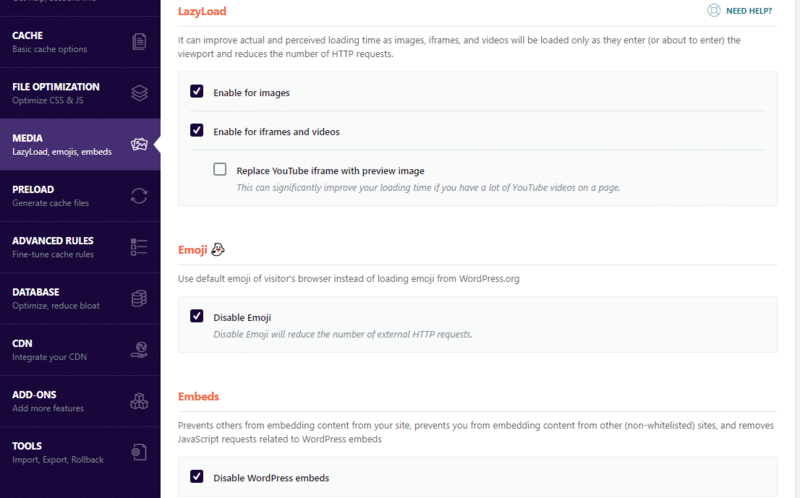 So while WP Rocket might have some features that free plugins don’t offer (for example, multiple cache preloading options are nice, and the advanced rules give you more flexibility), I think the main reason to purchase it is to simplify things and save yourself time. Simplify your life by eliminating the need to use lots of separate plugins. Everything is in one interface. 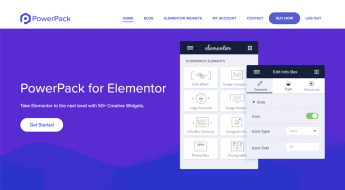 Save time because you don’t need to configure those plugins and work out compatibility issues. 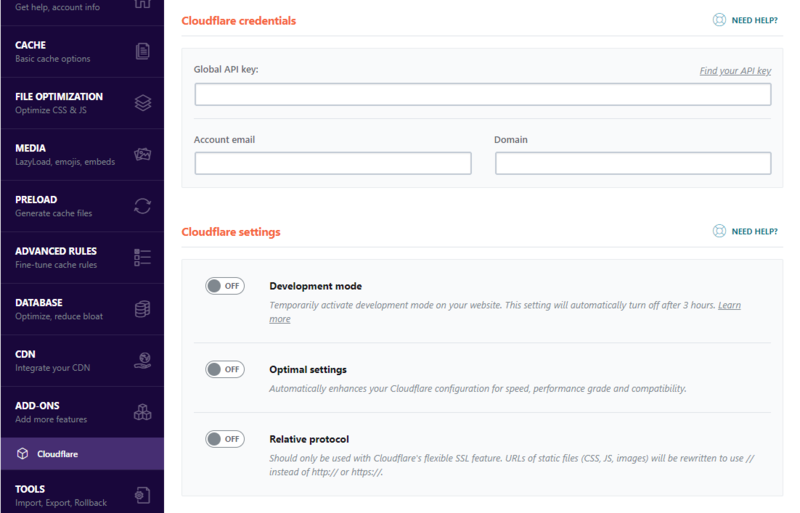 And you’ll also get access to dedicated support, which can certainly come in handy when you’re working on something technical like performance optimization. 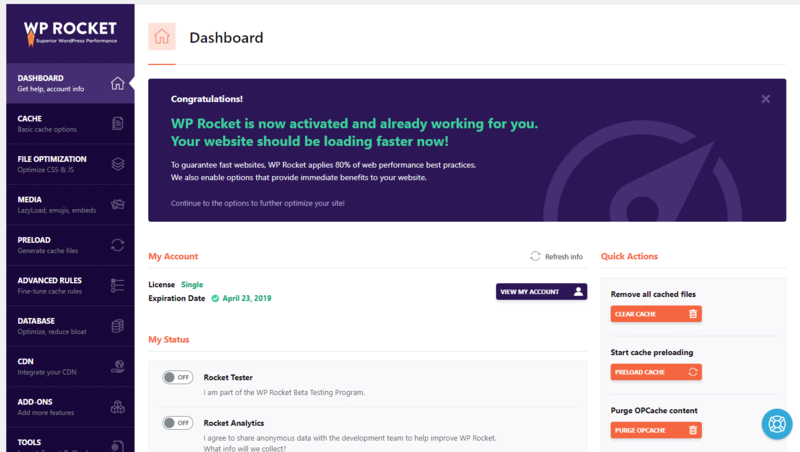 So, if those benefits are worth $49 to you, WP Rocket is definitely a great option to make your WordPress site load faster without pulling your hair out trying to configure complicated plugins or make multiple plugins play nice with one another. But if you’re on a really tight budget, you can find other ways to speed up WordPress…you’ll probably just spend a lot more time getting them working.